The drama "Sasaki Takatsuna" was written by Okamoto Kidô in November 1913 and premiered in October 1914 at the Shintomiza, with Ichikawa Sadanji II playing the role of Sasaki Takatsuna. It is a beautiful day in early spring. There are Japanese bush warblers chirping away while perched on red and white ume plum blossoms. Bathing in the sunlight, Nenosuke is washing the famous horse Ikezuki on grounds of the estate of Sasaki Takatsuna [?-1214]. Takatsuna's followers are talking about the victory of Takatsuna and Ikezuki over Kajiwara Kagesue [1162-1200] and his horse, Surusumi. The two raced each other across the river to win the honor of being the first to engage the Heike army in the Battle of Ujigawa River . Yet, despite today's wonderful weather and his enhanced reputation, Takatsuna does not seem to be in good spirits. His daughter, Usuginu, has returned from a visit to Ishiyamadera temple. She is accompanied by a Buddhist priest named Chizan. Takatsuna is pleased to see the priest, thinking that he can hold his monthly memorial service for a horse-keeper whose life he took some years ago. He immediately asks Chizan to conduct the service, and Chizan agrees. Before beginning the service Chizan mentions that he happened to see the Genji leader Minamoto Yoritomo [1147-1199] and how dignified he looks. Yoritomo is about to go to Kyôto to see the Emperor. The news puts Takatsuna in an even worse mood and a look of distress falls over his face. When Yoritomo raised an army ten years ago in Izu province to fight against the Heike clan, Takatsuna was eager to rush there. Unfortunately there was not enough time for him to reach his destination on foot, so he killed an elderly horse-keeper and robbed him of his horse, Ikezuki. 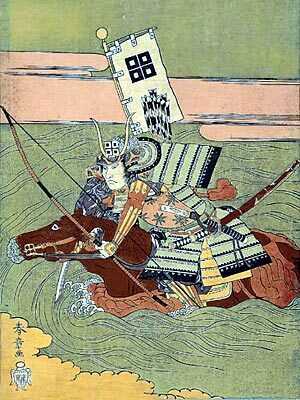 Thanks to the horse, Takatsuna was the first man to reach Yoritomo and rescued him from impending defeat. Yoritomo promised a reward, saying that for his brave actions he would give Takatsuna, half of his land. Ten years later, however, Yoritomo has yet to give Takatsuna even a tenth of what he promised. Takatsuna cannot suppress his anger at the thought of this betrayed promise. At this point Takatsuna's nephew, Sasaki Sadashige, comes to see him. He and Usuginu are deeply in love with each other. Full of cheer, Sadashige suggests that they go to greet Yoritomo, who is at the summit of his prosperity, but Takatsuna cannot stomach the thought. He hurries off to hold the memorial service, saying, "I cannot endure such a liar." Takatsuna's anger puts a damper on the happy couple's mood. Meanwhile all these years, the horse-keeper's son, Nenosuke, has been zealous in the discharge of his duties as horse-keeper. His sister Omino, on the other hand, bears a grudge against Takatsuna for killing her father. In order to avenge her father's death, she has come to Takatsuna's mansion to kill him with a woodsman's hatchet she hides in her bosom. In contrast Nenosuke is moved by the consideration of Takatsuna's consideration in never failing to hold the monthly memorial service for their father. Thus Nenosuke tries desperately to dissuade his sister from carrying out such a reckless act. Just then Takatsuna, having found spiritual enlightenment, emerges from the memorial service with his head shaved intending to become a monk . He has made up his mind to go to Kôyasan, headquarters of the Buddhist Shingon sect, where he is going to sever all ties of the flesh and live in eternal tranquillity. This provides the perfect chance for Omino to attack. She dashes forward and attempts to impale him. But Takatsuna disarms her, pins her down, and then thrusts her away saying, "Here is another who, like me, needs to be released from their evil passions." He collects the horse from Chizan and leaves for Kôyasan as an evening temple bell rings in the distance.